First Line: Tam Dunn watched the golf ball take a hard kick left and slip into the infamous Road Hole Bunker, a sandy-bottomed pothole that fronted the seventeenth green. What Tam Dunn finds at the bottom of the Road Hole Bunker gets Detective Chief Inspector Andy Gilchrist out to the Old Course at St. Andrews, Scotland on the double. A dismembered hand is lying in the sand, clutching a one word note addressed to Gilchrist himself. All the note says is Murder, but Gilchrist knows immediately that his nightmare has begun: a killer has him in the crosshairs. The seasoned veteran is no novice to solving murders, but this one comes at a particularly bad time. His ex-wife is dying, his son's girlfriend is missing, his boss insists on pairing him with a detective whom he has good reason to hate.... But when it rains, it pours, because this one hand is merely the beginning of a parade of body parts-- all bearing messages for Gilchrist. When I began reading this book, I have to admit that Gilchrist was the type of character I don't care for. He drinks to excess; he has no time for his family; and he falls into a very inappropriate relationship. But as the murder investigation progressed, DCI Andy Gilchrist started to grow on me. He's the type of detective who works on a combination of hard work and intuition. When his intuition helps him decipher the meaning of the cryptic messages found with the body parts, he knows he has very little time to solve the case because someone very dear to him will die if he doesn't put every molecule of his knowledge and strength into finding the killer. Through watching Gilchrist at work, through seeing him realize the grave mistakes he's made over the years, and through observing his realization that he has to change, I went from disliking this character to feeling a grudging respect for him. Now I am very interested in reading the next book in this series, not only because I want to see if Gilchrist is the type of man who's strong enough to make those needed changes, but because I want to see if Muir does more to develop some of the other very intriguing characters he introduced in this first book. 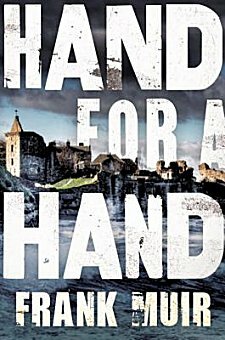 If you're a fan of British police procedurals, I recommend that you read Hand for a Hand. I'm glad I overcame my initial repugnance of the main character because the storyline is very good. It would be interesting to see what you decide. Thanks for pointing out my small error; I will get it corrected.